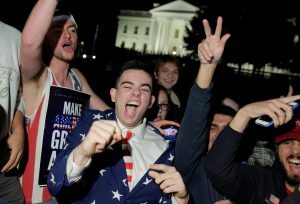 WASHINGTON — Americans emphatically declared their anger at government and their desire for change Tuesday as they decided between two presidential candidates who failed to generate much excitement. Exit polls recorded the simmering discontent of the American electorate. Four in 10 voters said they were hungry for change, and those voters overwhelmingly favored Republican Donald Trump. Smaller voting blocs who were seeking a candidate with good judgment, experience or who cared about them favored Hillary Clinton. Nearly 7 in 10 voters said they were unhappy with the way the government is working, including a quarter who said they were outright angry, according to preliminary results of exit polls conducted for The Associated Press and television networks by Edison Research. Three-fourths of those angry voters backed Trump. Six in 10 voters said the country is on the wrong track. And among the more than 6 in 10 who thought the economy is not good or poor, two-thirds supported Trump. Trump dominated among white voters, especially non-college-educated men; Clinton’s coalition was made up of women, minorities and young people. Trump, who once famously declared that he loved the uneducated, got plenty of love back from white voters who never graduated from college: He got 7 in 10 votes from non-college-educated white men and 6 in 10 votes from non-college-educated white women. The advantage Trump had among whites without a college degree compared with whites who graduated from college was the largest seen in exit polls for a Republican since the surveys started in 1972. Clinton, meanwhile, got the support of less than a quarter of white men without a college degree; Barack Obama, by contrast, drew about a third of their votes four years ago. Clinton did make some inroads with college-educated white women. Just over half supported her, while four years ago just over half of that group had backed Republican Mitt Romney in 2012. What kind of impact did third-party candidates Gary Johnson and Jill Stein have on the race? They siphoned more votes from Clinton than from Trump. A quarter of Johnson and Stein voters said they would have backed Clinton if they had to pick between the two major-party candidates. About 15 percent would have backed Trump. But most Johnson and Stein voters said they would have just stayed home if their only choices were Clinton and Trump. Even with his tough talk about Mexican immigrants, Trump held on to roughly the same share of Hispanic voters as Romney had claimed four years ago. Likewise, he was drawing about the same levels of support from black voters as Romney won. The Republican was drawing about a quarter of Hispanic voters and about less than 1 in 10 black voters. Clinton did better with Hispanic voters who were naturalized citizens, getting about 8 in 10 of their votes. She got about 6 in 10 Hispanic voters who were born U.S. citizens. Trump was winning more than half of white voters, who made up 70 percent of the electorate. Neither Trump nor Clinton gets bragging rights when it comes to honesty. About 6 out of 10 voters said they don’t view Clinton as honest and about the same share felt the same way about Trump. Opinions were more mixed on the question of temperament. More than half of Americans said Clinton had the temperament to be president and about a third felt the same about Trump. It was the working-class white men backing Trump who helped to produce a gender gap with a capital “G” for Clinton. Tuesday’s election was on track to produce the largest gender gaps since the exit poll began: The gender gap for Clinton — the difference between the number of men who voted for her and the number of women who voted for her — hit 13 percentage points. Clinton’s support among women was roughly even with the support that women gave Obama in 2008 and 2012. The bigger factor in this year’s wide gender gap: less-educated white men, who favored Trump far more heavily than they did Romney in 2012 or GOP nominee John McCain in 2008. The only presidential candidate that came close to Clinton’s gender gap this year was Democrat Al Gore, who had a 12-point gender gap in 2000. Clinton managed to hang on to the millennials who were such a big part of Obama’s winning coalition. Young people age 18-29 supported Clinton over Trump by nearly as strong a margin as their support of Obama over Romney in 2012. Those between 30 and 44 also were much more likely to support Clinton than Trump. Trump won the favor of those 45 and over. There were grim strains woven into voter sentiments as they cast their ballots. Nearly 7 in 10 voters said they were unhappy with the way the government is working, including a quarter who were outright angry. Six in 10 voters said the country is seriously on the wrong track and about the same number said the economy was either not good or poor. Two-thirds see their personal financial situation as either worse or the same as it was four years ago. One in three voters said they expect life to be worse for the next generation. Americans held their noses as they picked between Clinton and Trump: More than half of voters cast their ballots with reservations about their candidate or because they disliked the others running. After a long, hard-fought campaign, just 4 out of 10 voters strongly favored their candidate. The prospect of a Clinton or Trump victory was downright scary to plenty of voters: Seven in 10 Clinton voters said they’d feel scared by Trump victory; 6 in 10 Trump voters felt the same about a Clinton win. After all of the sound and fury over Trump’s treatment of women, it turned out the issue bothered half of all voters a lot — and women were more concerned about it than men. About 6 in 10 women were bothered a lot, compared to about 4 in 10 men, the exit poll found. It turned out voters were somewhat less concerned about Clinton’s use of a private email server as secretary of state. That issue mattered a lot to about four in 10 voters, including about 9 in 10 Trump voters. The survey was conducted for The Associated Press and television networks by Edison Research with 23,583 voters as they left their polling places at 350 randomly selected sites throughout the United States supplemented by 4,404 telephone interviews with mail, early and absentee voters. The results among all those voting have a margin of sampling error of plus or minus 2 percentage points.